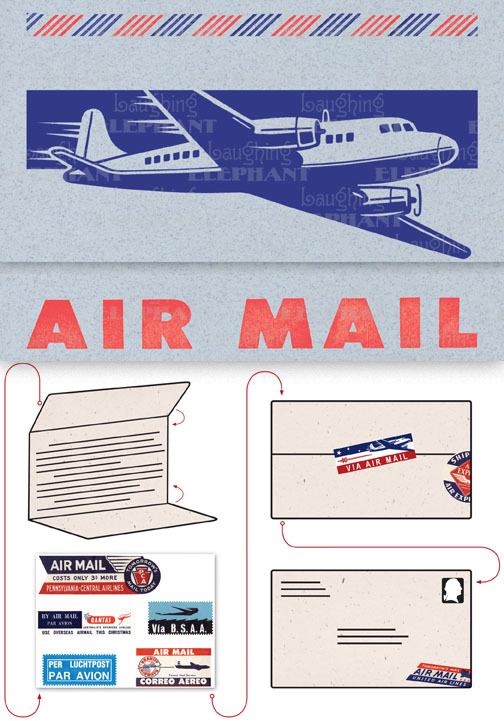 Evoke the glamor of bygone days, and with the it power of the written word, with these Aerogram self-mailers, which each come with vintage-inspired stickers to decorate and seal your important messages. You've got to get an urgent message to your contact in the French resistance, tonight. Fortunately there's a one a.m. airmail flight out of Casablanca. You ask the clerk at the Hotel Marquis for an Aerogram and scribble out your note quickly, taking care to seal it from the prying eyes of the authorities. You rush it directly to the airport and see that it makes it into the mailbag of the last Air Maroc flight. Secure in the knowledge that you've done your part for liberte, you repair to the hotel bar. This is but one scenario in which the Aerogram can be trusted to safely convey your most important communiques. The rest, dear customer, is up to you. Each card is folded to become mail-able, and is 7 x 4-3/8 (7 x 10 unfolded). Each is accompanied by three stickers for sealing and decorating, and is contained in a transparent bag.